Tens of thousands of teachers in the greater Los Angeles area walked off the job early Monday morning, Jan. 14, leaving the nation’s second largest school system in chaos. The strike negatively impacts the work, academic, and daily routines of nearly half a million students and their families, including LGBTQ students, teachers, and their families. Gov. 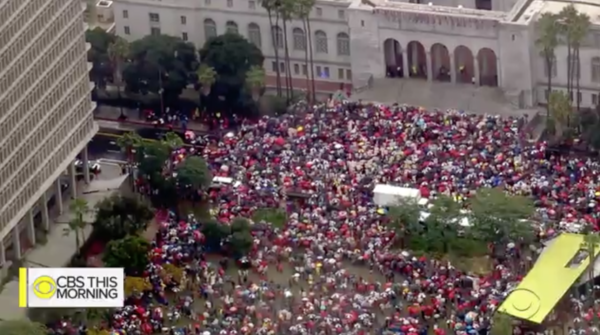 Gavin Newsom and Los Angeles Mayor Eric Garcetti have unsuccessfully urged teachers to return to the negotiating table, but buoyed by support for their first strike in 30 years, the teachers said no. They note that despite the extremely costly government shutdown, the school district and the state has billions of dollars held in reserve. A spokesperson for the Los Angeles Unified School District (LAUSD) told the Los Angeles Blade that schools will remain open and meals will be provided, but it’s unclear how many students would attend classes. A recent Human Rights Campaign survey reports that California’s LGBT students often suffer from higher levels of stress and lack of feelings of inclusivity. Staff in the LAUSD who work with LGBT students fear that a prolonged strike could have a far-reaching, unforeseen negative impact for those students. LAUSD has had programs in place to mentor and assist its LGBT students since the mid-1980’s, starting with Project 10, which has since evolved into the district’s Human Relations, Diversity, and Equality (HRDE) program run by LAUSD Student Health and Human Services staff. Dr. Judy Chiasson, one of three principal administrative staffers for the HRDE, outlined to the Los Angeles Blade the successes and programs implemented by her office. She also has oversight for the district’s LGBT pupils, as well as its educators and other staff members who work directly with students. Chiasson disputed those findings, saying the LAUSD is fully committed to the provisions of AB 537, the California Student Safety and Violence Prevention Act of 2000 and was an early pioneer taking steps to prevent bullying and abuse in its schools since the early 1990’s. Chiasson said that within any school system, especially diversified ones like the LAUSD, there will be students who may feel disenfranchised. But her staff and the greater LA area schools personnel work hard to communicate with parents, students, and school staff to promote a more stable and inclusive environment for the schools. The Los Angeles Blade reached out to Dr. Vincent Pompei, the San Diego-based Director of the HRC Foundation’s Youth Well-Being Project and one of the author’s of the report. Citing the report, Pompei was asked if only 20% of LGBTQ youth in California hear positive messages about being an LGBT person in schools, how much greater is that problem in the LAUSD versus districts in rural or agricultural areas, such as Fresno or the Central Valley in general? “Our data highlights that districts across the state, from the largest cities to the most rural communities, must take action and advocate for inclusivity and equality in schools — including by training staff, ensuring curricula are LGBTQ-inclusive and supporting LGBTQ student clubs, to create safe, affirming and welcoming schools” Pompei replied. Chiasson noted that other districts have emulated LAUSD as they implemented their own programs. She felt that LAUSD personnel would work hard to lessen the strike’s impact on the LGBTQ students. But the experience of Justine Gonzalez, a former candidate for LAUSD’s Board, appears to align more with the HRC report. The last LAUSD walkout in 1989 lasted nine days. Approximately 32,000 members of United Teachers Los Angeles (UTLA) including school nurses, counselors and librarians are asking for better pay, smaller classes, fewer standardized tests, greater charter school regulation and oversight plus adding more counselors, librarians and nurses. “Here we are on a rainy day in the richest country in the world, in the richest state in the country, in a state as blue as it can be, and in a city rife with millionaires, where teachers have to go on strike to get the basics for our students,” UTLA President Alex Caputo-Pearl told a crowd gathered in the pouring rain Jan. 14 at John Marshall High School in the Los Feliz district. “Here we are in a fight for the soul of public education,” Caputo-Pearl added while calling for the district to reinvest from its $1.86 billion in reserves and the millions in new money promised by the state. LAUSD Superintendent Beutner has said a neutral fact finder found that if the district met all of the teachers’ demands, LAUSD would be bankrupt in two to three years, according to KTLA. UTLA sources told the Los Angeles Blade that much of the failure to negotiate a new contract and meet at least half way on other union demands is Beutner’s unwillingness to hear out the union’s concerns. “He has his own agenda which is not in touch with the daily classroom realities that teachers’ face. Not mentioning the host of social and other outside family issues that can affect students. Basics such as even having enough to eat—even the diversity within the minority groups within the school system,” the source said. Weingarten also castigated Beutner and the LAUSD’s claims. Beutner, a former Los Angeles deputy mayor and an investment banker, has only been on the job less than one year and has no prior experience in education. “Our students need all of us to prioritize and invest more in education, from the City of Los Angeles, to the County Board of Supervisors, to our newly elected California State Legislature and Governor,” Gonzalez wrote. “The truth is that we all have skin in the game.” – Karen Ocamb contributed to this report.